I really wanted to brush my teeth before going to sleep, so I asked Jay about using the kitchen sink. The sink in my home drains into a collection tank, but Jay explained that this one drains outside. I figured nobody would notice if a little water drained out from me brushing my teeth, so I used the sink. In no time at all, a knock came on the front door. There were two armed security patrol officers, asking to talk to us. Jay opened the door, and one of the officers said, "I need to talk with you." They both looked really serious. I figured we'd violated some a law. This wasn't a routine check. None of the other vehicles were being inspected. The officer then asked, "Is this a Tumbleweed House?" Jay confirmed that it was. 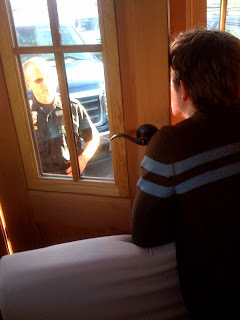 The officer went on to explain that he had visited Jay's website and was planning to buy two of his homes. He described the models that he wanted to buy and asked for a tour of this one. 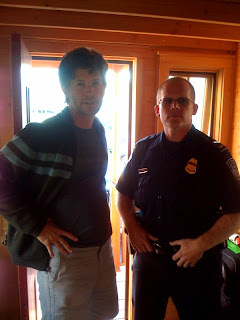 Below is a photo of Jay with one of the officers. We all had a really nice visit, and answered some of the officer's questions about small home living. Traveling with Jay is like traveling with a rock star or celebrity. It seems like everywhere we go, people know him and admire his homes. It's really quite entertaining. Well, I'm going back to sleep. I'll check back in later tonight -- assuming we don't have more visits from members of Jay's fan club.